Several years ago I returned to a dairy-free diet when I discovered that I had not outgrown my childhood milk allergy. Since I had never been fond of milk or cheese (I know, its just me and the cows on the cheese) there were only a few rough spots in the transition. The primary issue was that milk was in everything, including my favorite breads and cookies. Not willing to sacrifice the carbohydrate department, I eagerly took up baking from scratch. Nonetheless, butter emerged as a challenge. Margarine would seem a simple substitute, but trading one evil for a trans fat loaded other was not a good enough option. For even more butter alternatives and dairy-free recipes, order a copy of my book, Go Dairy Free: The Guide and Cookbook for Milk Allergies, Lactose Intolerance, and Casein-Free Living. Article by Alisa Fleming, founder of GoDairyFree.org. Go Dairy Free the book is available to purchase from Amazon and other major booksellers. 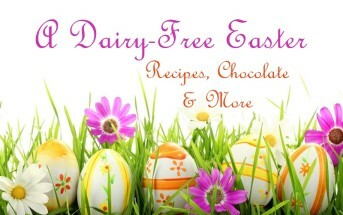 Need Go Dairy Free now? Order the E-Book for immediate delivery or download it to your Kindle. Thank you for the information, my son have milk allergy too, I think I will try this out. I hope it works out well for you and your son! Very useful post for all the people who actually somewhere want to use dairy free products for baking and cooking. My suggestion would be to go with margarine because it has less saturated fat than butter and helps to reduce blood cholesterol. It is good for baking cookies. I would also recommend to check the nutrition facts related to margarine before purchasing it. Please remember to choose non-hydrogenated margarine. This has been very helpful! 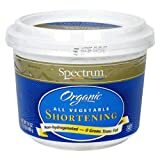 I was searching to find if veg shortening was dairy free and came across this site. My son is allergic to milk, egg, cheese, butter (all diary products) along with all nuts, seeds, peas and beans and cinnamon! It’s been a struggle for him since the diary products was added this year and he’s had to cut out all the things he liked to eat. Do you know any cheese or butter substitute that I can use to put on bread for him?? I live in the caribbean so availability of products is a problem but I can try and bring in whatever he needs. Do they have Earth Balance where you live? Hi there! I just found out recently that my son has food allergies…a lot of them! My dilemma is that he is also allergic to sunflowers and the oil that is in every kind of butter substitute I have found on the market. So when I am making sauces from scratch and have to use butter and flour as a base we are using lard, but this leaves the meal tasting greasy insead of buttery… how do I fix this so my beef stroganoff tastes like it smells and not like a bland boring dish? Can I use a fruit puree instead or would that just make it too sweet? Any insite would be helpful. I would use a combination of olive or coconut oil and ground cashews (or cashew butter). Fruit puree wouldn’t taste right – too sweet. I had to start eating dairy free a year ago and it has been a challenge baking. I have tried the Earth Balance sticks as a substitute for baking and here’s my problem. It smells HORRIBLE when mixing it and worse when baking! The over all taste is not too bad but my family can definitely tell the difference. I looked at other margarines, willing to sacrifice a bit of healthy living for a good substitute for holiday baking but of the two I could find they both had milk in them. I can’t imagine how oil is going to make my holiday cookies taste. Any other suggestions? I have a great substitute for milk if anyone is interested. Elizabeth, oil works amazing in cookies and is my go to. Everyone devours them, dairy-free or not. I think I cover it pretty well on my site, but you can also find oil-based cookie recipes in GDF the book. There are definitely some great oil-based cookie recipes here on the site! My preferred oils for cookies are coconut oil, grapeseed oil, or extra-light (not extra-virgin) olive oil. Finally! I am so happy to find a site with someone who is also allergic to milk. I didn’t know as a child that not everyone had itching around their mouth when they drank milk and that not everyone had a tingly sensation on their teeth from it. I thought that was how everyone felt when drinking milk. I broke out in hives and since I lived on a farm, I was tested and treated for all kinds of things but never for a milk allergy! I don’t know why except I guess there wasn’t much knowledge about it back then. So…I want to thank you for the information on your site. I find, thanks to a doctor’s knowledge, that I can have small amounts of hard cheese. The further from fresher milk the product is, the more likely the protein had been altered to where it will not affect me, or at least as much. I LOVE cheese so its been very hard to keep the amounts low…but then ya gotta do the same with chocolate, right?! Also, baked goods with low amounts of milk baked longer are usually okay for me. But I long for a scone…. The recipes use whole milk and heavy cream and lotsa butter! I luckily found your site looking for butter alternatives and I’ll use vanilla flavored soy milk and about 1Tbsp oil to replace the milk and cream. Hope it works out okay. Hi Su, I’m so happy I can help! As for those scones, there is a great basic recipe in my book, Go Dairy Free (actually, there are three scone recipes in there!). The recipe is super easy and well-loved. For scones, I prefer to use coconut oil or palm shortening in equivalent amounts. When solid, it cuts in just like butter and produces a tender, flaky scone. I have posted this “healthier” scone recipe to give you an idea – http://www.godairyfree.org/news/nutrition-headlines/vegan-whole-grain-scones-made-with-coconut-oil-and-unrefined-sweetener. Good luck and I hope you enjoy some tasty scones soon! !